To thank surgeon Dr. Justin de Beer, former site Chief of Orthopaedic Surgery at Juravinski Hospital in Hamilton, Ontario, and Clinical Associate Professor at McMaster University, who retires in the coming year, I wanted to come up with a gift idea that was unique, humorous, and meaningful. I thought that a leg lamp ornament from the movie “A Christmas Story”, or a Radio City Music Hall Christmas CD that has a cover featuring the shapely legs of the Rockettes all in a row, would be amusing gifts for an orthopaedic surgeon who specializes in replacing knees and hips; but then again, over his lengthy career, Dr. de Beer probably received numerous similar gifts. I would need to dig a little deeper into my own experiences for inspiration. In 2014, I had a very successful right knee replacement with Dr. de Beer. During a visit to a sports clinic in the spring of 2018, I learned that he was retiring in February, 2019. I knew without a doubt that I wanted Dr. de Beer as my surgeon for my second knee replacement, but wondered if I was ready for surgery. Since launching SIDEBURNS Magazine in September 2017, I was spending a lot of time on my laptop writing articles and preparing interviews--stationary activities that did not challenge my left knee, plus I was able to control the pain with OTC medication. At my first appointment with Dr. de Beer in April, it was apparent I was not quite ready for surgery. By early August, 2018, at my second appointment, it was obvious that the status of my left knee had changed drastically. I explained that after walking around Collingwood for three straight days covering the Elvis Festival, I knew TKR surgery was my only option. At the conclusion of my appointment, I gave Dr. de Beer my business card as a way of explaining what I do with SB and why mobility is important. Three months later, on November 14th, 2018, heavily sedated and about to have TKR surgery, I asked Dr. de Beer as he entered the operating room, not questions about my surgery, but if he had checked out my website. “Not yet,” he replied. As I drifted off to sleep, I murmured, “Maybe you will have time in retirement.” This brief exchange provided the seed for a unique, meaningful and humorous gift: I would make an ETA gingerbread cookie for Dr. de Beer! My follow-up appointment was five weeks and one day after surgery. I had healed sufficiently by the fifth week to stand and sit at my daughter’s kitchen island to make cookies. It took me 3 hours to decorate three acceptable cookies. I had to draw and design a wig/hair that looked like the ETAs I have come to know over the last year and a half, and experiment with the glasses to look get them to look just right. Each cookie was hand-crafted, so just like the individual ETAs, each gingerbread ETA was unique. I decorated with red, black and white icing—SIDEBURNS Magazine’s signature colours, and took some liberty with the jumpsuit designs. The night before, I picked what I thought was the best of the three cookies to give to Dr. de Beer, but in a rush to get to my early morning follow-up appointment, I inadvertently picked up one of the other, good, but not favoured, cookies. I placed the gingerbread ETA on a black paper plate, put it in a cookie bag, and attached a business card on which I wrote the words, “Thank you. Thank you very much.” It did not occur to me to glue the cookie to the plate with icing, so my special cookie kept sliding off the plate and the cookie bag kept falling sideways in my tote bag. Fearing my cookie did not look like special gift I had envisioned, I said to my daughter, “I don’t think I can give this to Dr. de Beer. My daughter encouraged me to proceed as planned. “He is going to love it! It is the thought that counts.” At the end of my appointment, I gave Dr. de Beer his ETA cookie. My gift was received with appreciation and enthusiasm. Dr. de Beer graciously posed for a photo with his patient, Carolyn MacArthur, Editor of SIDEBURNS Magazine. The cookie story does not end here, however. No one was more surprised than I to see an email from Dr. de Beer the next day saying how much he and his wife loved the cookie. 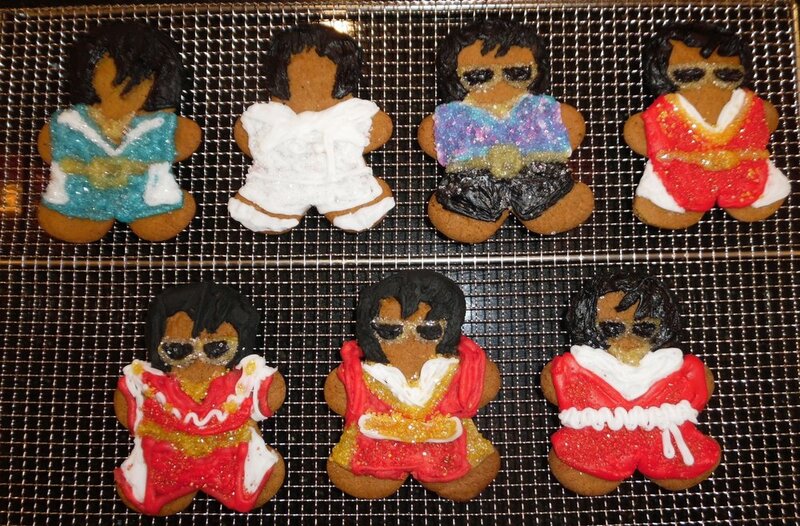 He wondered if I had more, as they wished to give some to their friends who are big Elvis fans. I was over the moon happy to accommodate his request. I spent another three hours making more cookies. I was able to design and decorate five cookies this time; and because I wanted to experiment with Elvis costumes and give Dr. de Beer more selection, I went beyond the jumpsuits and made one with the “If I Can Dream” white pant suit, and one with an Elvis-like printed shirt and black pants. Dr. de Beer selected his two favourites, and I added a third for his wife. Two of the four remaining cookies were given to my physiotherapists, Miriam and David, and the other two were given to the ladies on the front desk of Fit for Life. Merry Christmas and Happy New year! Best regards, Carolyn. Dr. Justin de Beer completed his orthopaedic training at the University of Cape Town. He then went on to do a 2 year fellowship in arthroplasty through the University of Toronto. His primary focus is on hip and knee arthroplasty including both primary and revision surgery. Dr. de Beer is currently the director of the Hamilton Arthroplasty Group research centre and past site Chief of Surgery and Orthopaedic Surgery at the Henderson (now Juravinski) Hospital in Hamilton. He is an active member of the McMaster University Orthopaedic faculty with an interest in teaching both undergraduates and postgraduates. Dr. de Beer’s research interest is on the outcomes of adult total joint replacement surgery. He has more than 60 peer-reviewed publications and multiple presentations at national and international scientific meetings to his credit. He has been awarded the Queen’s golden jubilee medal as well as a Cornerstone award from Hamilton Health Sciences and a Merit award from the McMaster Orthopaedic program for his contributions in his field.